Just got back from the annual extended family week at the beach. Waves, junk food, sand in everything! Our family has many traditions that go along with our beach week -- the sticky buns from a local bakery being at the top of the list. There are also the newspapers. All week my mom gathers whatever local newspapers she can find and even family members who aren't avid readers find themselves perusing the pages. After all, beach newspapers are a little different from your average hometown newspaper. Where else can you read about the cost of "re-boarding" the boardwalk, a day in the life of the guy who weighs in the huge marlin brought in during the fishing tournament or what happens when people retire to the beach (in one case he became the guy who spends 10 hours each day building sandcastles). This week my mom read an article about a local writer who just released her debut novel that takes place in one of our favorite Delmarva beach towns. It was a great article promotion wise: two photos, big headline, mentioned an upcoming book signing and that the book was published by a small local publisher. Anyway, it convinced us. We had to have that book. That night we headed to the local bookstore. These are small beach towns and almost every one has one indie bookstore for that tourist who needs a beach read. We found the local authors section but it wasn't there although we saw several other books by the same publisher. Hopefully, they had all sold but there were more books "in the back". We turned to the frazzled guy behind the counter. "It was called The Sea Sprite. Something like that. The cover is blue. It's a mystery. A local author." The man at the bookstore looked at my mother blankly. "There was just a big article about her in the paper. She's doing a book signing." He checked his clipboard. "Not here. I haven't heard about it." An author was having a book signing this week in a town ten minutes away and he hadn't heard about it? Amazing. Please authors, if you are lucky enough to have an article published in a local newspaper make sure that every book selling spot in the newspaper's reach knows about the article and your book. Because sometimes articles encourage people to buy books! But if they can't find the book most people will abandon it quickly in favor of another book that is right there in front of them. After all, we have all become accustomed to the instant gratification of online shopping. Happily for this author, my mom is searched until she found it--two beach towns later. Let this be a lesson for all authors...get to know your local indie book sellers. Even if you don't have a book signing at their store, make sure they at least stock your book. Give them a simple flyer or a few bookmarks for their counter or window. You never know when something so simple is going to pay off. Don't let you prospective readers become discouraged. 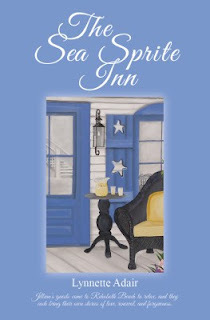 And for the record we were partially correct with the book title: The Sea Sprite Inn by Lynnette Adair and the cover is blue! Jodi M. Webb is writer living in Pennsylvania who also is a WOW blog tour manager. Her next tour will be Sugarland by Martha Conway, a novel that involves murder, Chicago and 1920s jazz clubs. Contact her at jodi@wow-womeonwriting.com if you're interested. You can find her blogging about books at Building Bookshelves. You bring up some great points and again something most new authors would not even think about. Marketing is so overwhelming! Anyway, glad you got your hands on that book! My mom loved it and it's my turn next! check out building Bookshelves for a review in September. What a great story! I also love reading local newspapers when I'm on vacation. Your post is a wonderful reminder to take advantage of all opportunities available. Being covered in the local paper is a great introduction!